Excess sun exposure can lead to visible signs of accelerated aging and sun damage, and can even increase your risk for cancer. Over the years, there has been lots of controversy surrounding the safety of your skin in the sun, as well as the best types of sunscreen to use. New research has shed light on the differences between UV-ray types, and has uncovered facts about the efficacy of some of the chemicals commonly found in over-the-counter sunscreen products — leaving many individuals unsure about how to go about choosing a sunscreen product. Both the National Cancer Institute and the FDA have stated that very little evidence exists that prove whether or not some sunscreen products are truly harmful to your health. Other environmental and health organizations have found that the chemicals used in sunscreen products exist in our water sources, fish, algae, and even in up to 75 percent of a mother’s breast milk. The best way to protect your skin from the sun is to stay informed and make the best decisions when it comes to choosing a sunscreen. SPF stands for Sun Protection Factor, and generally refers to the approximate amount of time you can spend in the sun without experiencing sunburn or sun damage. For example, using a sunscreen with an SPF of 20 would allow you to stay in the sun about 20 times longer than you could without wearing any type of sunscreen. Most people will buy sunscreen with the highest SPF possible under the impression that it will offer the best sun protection. However, the higher SPF you choose, the more chemicals the product will contain in an effort to protect your skin from the sun. In fact, in 2001 the FDA proposed the banning of sunscreens that had an SPF of over 50, stating that these products lacked value and efficacy when it came to protecting skin from the sun. 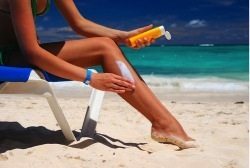 People who wore sunscreens with SPFs higher than 50 also tended to stay out in the sun longer, exposing themselves to a higher risk for sun damage. The SPF in sunscreen products refers only to UVB rays, however, protection from UVA rays is also needed to maintain youthful, attractive-looking skin. Sunscreens that offer “broad spectrum” protection contain properties that will protect your skin against harmful UVA and UVB rays. Look for broad-spectrum sunscreens that contain the ingredients “Mexoryl SX” or “Mexoryl XL,” which offer the greatest protection against UVA rays. Avoid purchasing broad-spectrum sunscreens that contain Parasol, which tends to break down when exposed to the sun and could increase your risk for sun damage. When shopping around for sunscreens, you will be faced with two main options. The first option is chemical sunscreens, which are highly toxic, promote hormonal imbalance, and can increase your risk for cancer. The second option is mineral sunscreens, which are generally 100 percent organic, provide stable performance when exposed to the sun, and do not have a negative impact on the environment, according to the Environmental Working Group. Use sunscreen lotions — not sprays — that contain a minimum SPF of 15 and are water-resistant. Also, avoid using sunscreens that contain an ingredient called “Oxybenzone,” which has been proven to increase the risk for hormonal imbalance. Rock Creek Wellness offers a number of aesthetic services and skincare products in Kansas City designed to help you look and feel your best. Reveal the beautiful, youthful skin that is hiding under years of stress and free-radical damage through our pharmaceutical-grade aesthetic services. Contact us today to schedule your free consultation and learn more about our chemical peels and skincare products that can help reverse the aging process.